Aguna Resort is the perfect place to relax and unwind. You can find us on Tioman Island an intriguing island of rainforest, sandy beaches and coral reefs in the South China Sea, off the east coast of peninsular Malaysia. 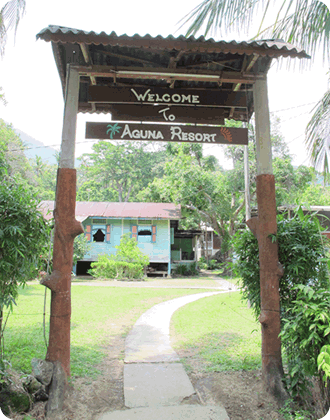 Aguna Resort is a place for those who don't want the standardized, impersonal, expensive service of a big resort nor the discomforts of a cheap beach hut. Set on a hill of giant rocks and flowering plants, all our chalets have verandahs with open views out to sea. Built of varnished wood in a traditional, airy Malaysian style, the chalets have windows that open from the roof to the floor and a ceiling fan to waft the air. They are simple, comfortable and beautiful. We supply a kettle with tea and coffee so you can start the day in a leisurely way on the veranda. Aguna Resort & Seafood Restaurants are near the chalets door, serving inexpensive local and western dishes, fruit juices and beers. There are provided breakfast, lunch and offer fresh fish barbecues in the evenings. They all have tea and coffee making facilities with a never ending, free supply on 24 hrs. In addition, we also provide rental bicycles and supply travelers hikers. All our rooms have sheets, blankets on request, towels, toilet paper and soap .We also unlimited supply of hot and cold water are free for all our guests. The attached bathrooms have hot &cold water supply, a basin, a mirror and a western-style toilet.